Home City Wise Will Walnut Hills Rise Again? Will Walnut Hills Rise Again? To hear Kevin Wright and a host of neighborhood activists tell the tale, the resurrection is nigh. But it’s been a long time coming. 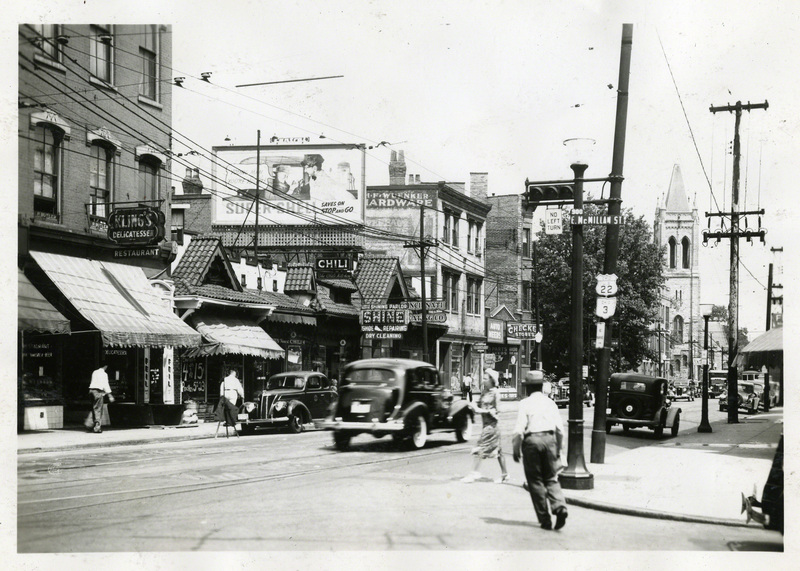 Historic, bustling Gilbert Avenue at E. McMillan Street (photograph undated). September 12, 1940: A new-model Ford pulls away from the curb and heads west on East McMillan, passing a woman who’s little more than a blur on a bike. A man stands still, just a few steps into the street, debating his next move as pedestrians weave around him on the sidewalks and streets. Streetcar wires web the sky. 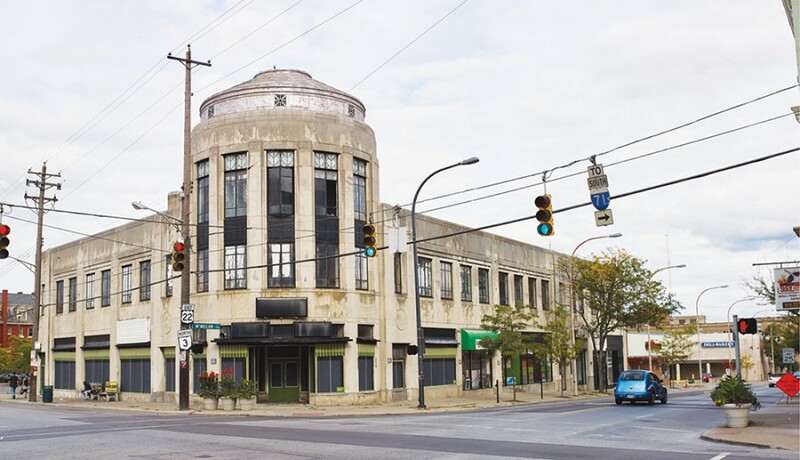 Peebles Grocery closed nine years ago—so it goes when a depression hits—but the corner building has already been remade: Under a towering spire advertising the Paramount Theater, the rotunda at Gilbert and East McMillan sports window signs for Franklin Life Insurance Co., Paige Beauty Salon (air conditioned! ), and McDevitt menswear shop, with full window displays and large striped awnings. Turnabout, starring Adolphe Menjou, is currently playing just down the block, and a tangle of signs and cars and people and shops stretch on beyond the camera’s frame. The Paramount building on Peebles Corner, photographed September 12, 1940. September 12, 2015: It’s been raining all day, and a deep chill hangs in the air. A few couples walk hand-in-hand up Park Avenue; a drum beat thumps through the walls of the Brew House. It’s 7:45 p.m. and Music Off McMillan is underway. A man leans and wails on a saxophone in front of Cuts Plus barbershop, standing on freshly poured sidewalks under the glow of bright new streetlights. Up the street another guy settles back in a chair, his gaze and electric guitar notes fading into the Kroger parking lot. Further than their sound can reach, an acoustic guitarist stands outside of Fireside Pizza’s open sliding stacker doors. He’s got one avid listener sitting next to him, while the rest keep warm inside. Down around the corner at The Greenwich, a neighborhood mainstay for two decades, the night’s closing band prepares to play, while the bar seats fill up across the street at Angst Coffeehouse. The Paramount building in 2015. Currently in disrepair, WHRF purchased the property in late September for redevelopment. 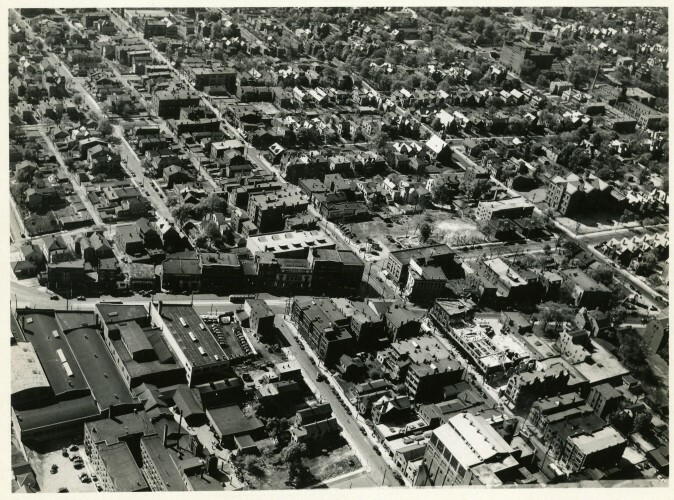 In 1960, the population of Walnut Hills was 20,658. In 1980, it was down to 9,907. And in 2010? 6,495. Although there may be fewer of them these days, the resident leaders—old and new blood alike—are fiercely committed to the neighborhood and its renewal. They’re serious about doing it their way, a.k.a. the Walnut Hills Way. That means not wiping the slate clean to build a shiny new place to play, not disregarding the existing residents, not sacrificing the historic character and diversity of the neighborhood, not accepting any development without first taking a close look at what it will ultimately entail. Yet it also means a dogged effort to jumpstart the Walnut Hills economy, to again fill the sidewalks and storefronts and homes, to build anew on vacant land, to re-energize a once-prominent part of town. It’s one neighborhood’s effort, anchored by the dedication of a few longtime advocates and propelled by a recently reinvigorated redevelopment foundation. But it’s also a grand experiment in whether equitable urban redevelopment is possible—here, or anywhere. It’s early May, a so-this-is-climate-change kind of warm day. At a sidewalk table outside of Fireside Pizza, one of those leaders, Fred Orth, describes his plans to reinstate a 79-inch-tall, 3,979-pound bearded green limestone man across the street, in a vacant lot he’s transforming into Green Man Park. Carved by David Hummel (the stonemason whose work can be seen at City Hall and the Eden Park reservoir pump station), Green Man held court at that corner of East McMillan and Chatham from the 1880s until the building it was a part of was unceremoniously knocked down in 1991. Orth has been a neighborhood fixture for some time: He bought up several brownstones on Morris Street in 1973 during a spate of foreclosures, though it took a few years to get them rehabbed and into the hands of friends. “Nobody would loan on them because the neighborhood was redlined,” he says. “They don’t do that,” he adds, sarcastically referring to the bankers he approached back then, though that practice most definitely had a hand in shaping the neighborhood’s present. Orth persisted and has been active in Walnut Hills ever since. Before leaving to tour the park and visit Green Man at his temporary home at HGC Construction, Orth hands over a thick green plastic pen emblazoned with perhaps the most bold and hopeful marketing slogan for any of Cincinnati’s 52 neighborhoods: Historic Walnut Hills 200 Yrs of Diversity Just North of Eden. When Lyman Beecher showed up in 1832, the riverboat was king, Cincinnati was booming, and land north of the Ohio was indeed a kind of Eden to the more than 2 million slaves in the antebellum South. The boom was so big that back east, the powers that be worried these western hinterlands would become lawless free-for-alls without some moral oversight. Thankfully, the Presbyterians were on the case. Beecher came to run Lane Theological Seminary, founded in 1829 on land carved from Reverend James Kemper’s farm, Walnut Hill (where Thomson-MacConnell Cadillac stands today), with his family—including his 21-year-old daughter, Harriet, whose book Uncle Tom’s Cabin would eventually cause such a public uproar about slavery that Abraham Lincoln reportedly called it “the book that made this great war.” What happened at Lane went on to influence how Walnut Hills would identify itself far into the future. With the Emancipation Proclamation still three decades away, public opinion in the North was split on the institution of slavery; even when white citizens were against it, they leaned heavily toward the concept of repatriation and colonization—re-purchasing Southern slaves and shipping them back to Africa. This was problematic not only logistically but in its fundamental ignorance of the slaves’ humanity. “That prejudice, that racism—this is what lit up [Lane seminarian] Theodore Weld,” says Chris DeSimio, president of the Friends of Harriet Beecher Stowe House, which operates the home today. “So when he came here to look for a place to ‘win the battle of the West,’ he was going after colonization.” Weld sponsored a series of debates over 18 nights in February 1834 to argue the issue of colonization vs. abolition, the first known public discussion of the issue anywhere in the country. More fiery revival meeting than prosaic public assembly, it caused something of a scandal and attracted boisterous crowds. In the end, the seminarians, who came to be known as the Lane Rebels, resoundingly voted for immediate abolition, and also went to work among the free black population downtown, treating them as equals. This made the seminary’s trustees nervous enough to forbid any more public talk of abolition, so the students left Lane and carried their fight to Oberlin College. Nearly two centuries later, this past feels quite present for many in the neighborhood, little known as this particular slice of history may be to the city at large. Kathy Atkinson—by all accounts and introductions a feet-to-the-fire sort of force, the very face of tough love—has been working in and for Walnut Hills since 1993. She started by tutoring high-risk teens through her then-job at New Thought Unity Center and eventually went on to spearhead a grant project that resulted in the Vision 2010 plan, agreed upon and codified by both the Walnut Hills and East Walnut Hills community councils—a first. It’s 9:45 a.m. on a Wednesday in the middle of July. Jackhammers are already making a loud racket on East McMillan, busting up concrete and laying the work for the new sidewalks, trees, lighting, and signage coming to the block—the kinds of things urban planners get really excited about but will take residents a while to fully appreciate. Just past Kemper, two guys in cherry pickers carefully repair the 120-year-old masonry on the facades of Phase 1 of the Trevarren Flats project. Out back, drywall is hoisted through windows as a century’s worth of debris is piled into a dumpster. 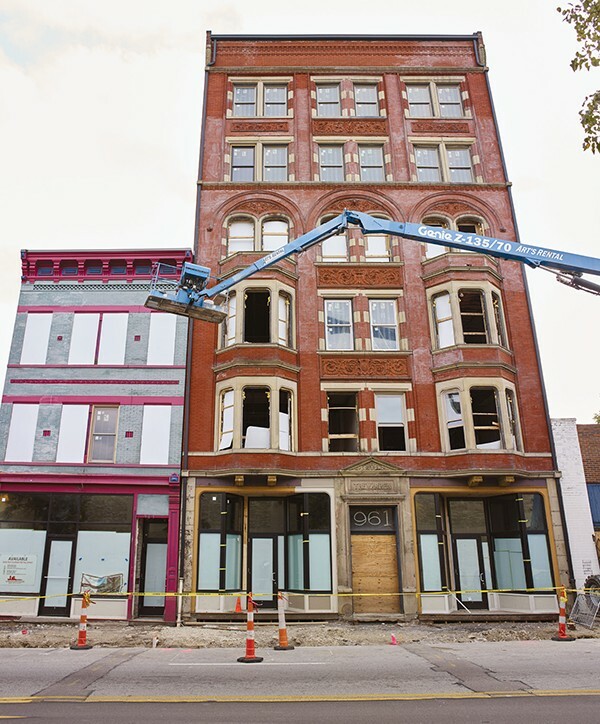 “These buildings were bad,” says Bobby Maly, chief operating officer of Model Group, which is running the gut rehab that will turn the three (long unoccupied) buildings into 30 market-rate apartments and 7,000 square feet of commercial space. “They took on a ton of water. 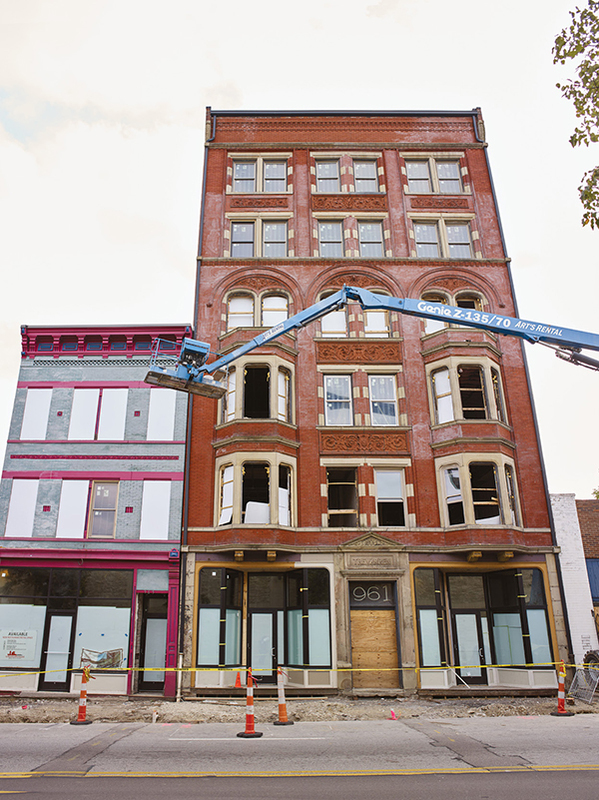 There was fire [damage], asbestos, mold, lead—all the good stuff.” Construction started in February, and it’s moving fast: To meet historic tax credit and investor demands, they only have until December 31 to get a certificate of occupancy. Construction is underway on Phase 1 of the Trevarren Flats project. Two of the three buildings are shown here. The fact that Walnut Hills already had a thoroughly discussed and documented community vision—the result of years of work, with resident and stakeholder input, wrangled by Kathy Atkinson—certainly doesn’t hurt, and neither does her continued eye on things. It’s no secret that Walnut Hills has grappled with high unemployment and generational poverty for decades. A Community Building Institute assessment earlier this year put the neighborhood’s unemployment rate at 25.4 percent for adults ages 16 and up—with staggering rates for the young (45.2 percent for 16- to 24-year-olds) and black (35.8 percent for black adults vs. 6.6 percent for white adults)—and noted that 46.3 percent of families lived below the poverty line. To chip away at these seemingly intractable issues, Atkinson helped coordinate a job bank with Model Group and other community organizations to put neighborhood residents to work on Trevarren Flats (which the developer says has been successful), and WHRF ran a youth ambassador program this summer with funding from Easter Seals. On top of that, there’s diversity—in race but also in age and income, hitting all steps of the ladder from extreme poverty to extreme wealth. 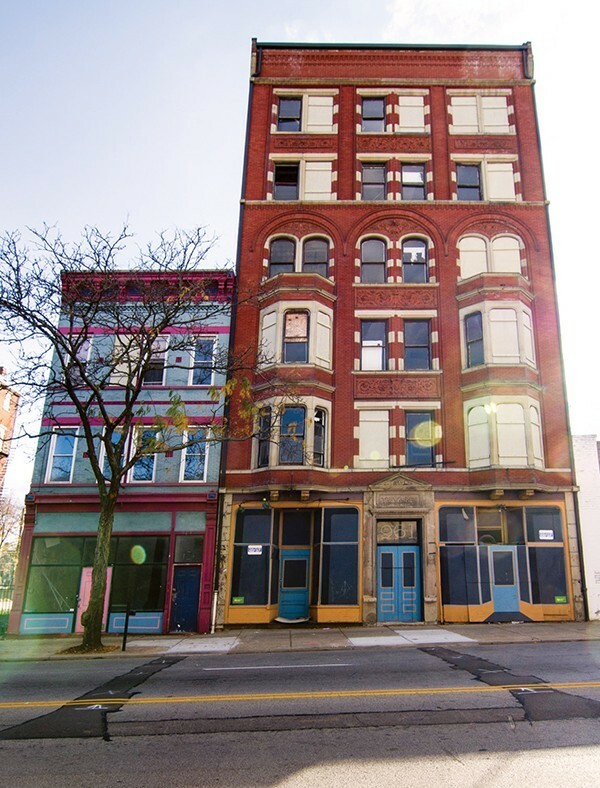 “I can’t think of another neighborhood in Cincinnati where everyone kind of just lives in the same environment and gets along for the most part,” says developer Ed Horgan of AGID Properties. “It happens that diversity, from a purely economic standpoint, is also a really valuable brand because it’s so different,” says Kevin Wright. And this list of reasons? It’s the same that many residents cite for moving to or staying in the neighborhood. Horgan first invested in Walnut Hills in 2000, buying and rehabbing a 36-unit apartment building at the corner of Park and East McMillan. “[It was right near] the business district, and even though it had fallen upon hard times, you could still walk to the grocery store, the library, restaurants, the dry cleaner, the bank—there were still plenty of core assets that a lot of business districts in town don’t have. So that got us excited,” he says. And excited they stayed: About three years later came a large condo conversion near Eden Park, then the renovation of the historic Cooper and Verona apartment buildings into condos, which they completed during the recession. 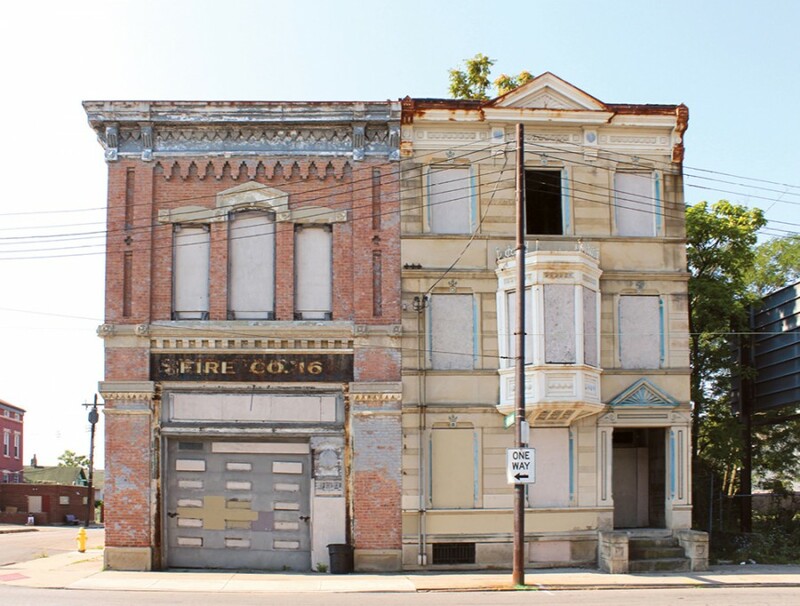 In the past few years, and with new partners, Horgan has renovated two abandoned buildings into apartments and retail spaces opposite Beck Paint & Hardware (itself a neighborhood institution since 1959), and plans to rehab 15 apartments and five storefronts on the next block. The opening of Fireside Pizza is viewed by many as a linchpin in the recent spate of development. Fire Company No. 16—the oldest firehouse still standing in the city—had no roof, no second floor. Vacant and abandoned since 1976, it was slated for demolition until a perfect storm of Fred Orth, then–Vice Mayor Roxanne Qualls, and developer Kent Hardman (who also owns buildings next door and across the street) combined forces with WHRF to change its fate. 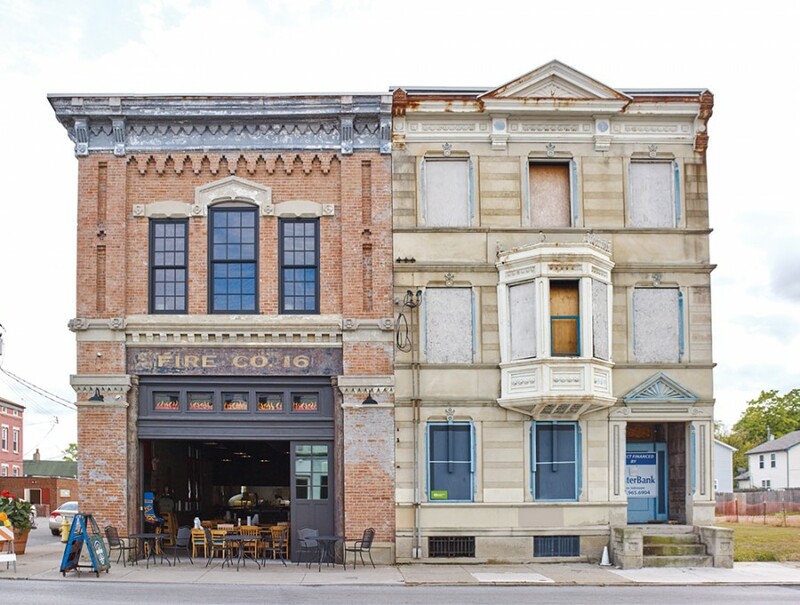 With help from the city, it was stabilized in 2012; two years later, Fireside began serving beer and wood-fired pizza to hungry neighbors. The historic firehouse before its renovation. Fireside Pizza opened in September 2014, in an historic firehouse barely saved from the wrecking ball. 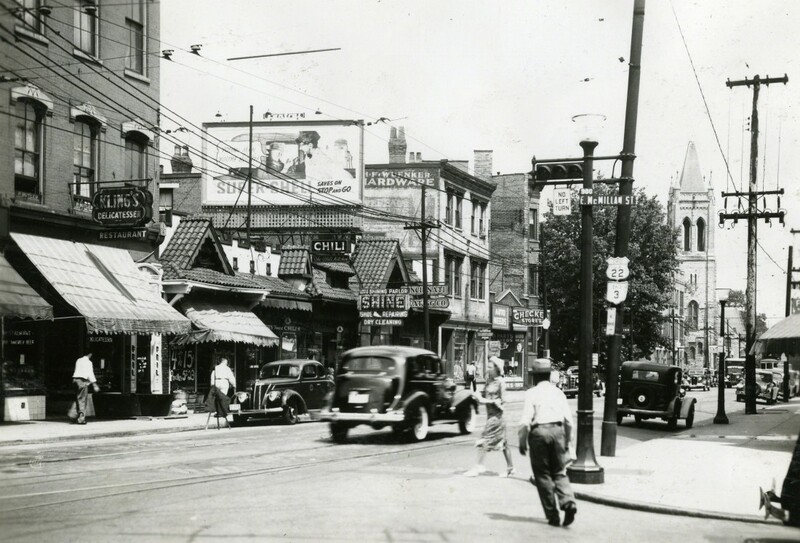 Walnut Hills was the city’s second downtown, a major streetcar transfer point, a shopping district. “It was the suburbs up until the suburbs became the suburbs,” says Charles Dillard, who returned home to run his medical practice in the neighborhood from 1975 until 2008. He is 80 now. “I grew up here on Burdette,” he says, pointing out the front window of Mardi Gras on Madison, the new Cajun restaurant on DeSales Corner, where he’s covered the table with historic photos. “That was during a time when black people had difficulty getting houses, but my father was a doctor and somehow we lived on Burdette.” He remembers the Paramount and Orpheum theaters in their heyday, the stores and restaurants and delicatessens that surrounded Peebles Corner—so-called, the story goes, because an enterprising grocer bribed streetcar drivers to use his store, built at the corner of Gilbert and East McMillan in 1883, as the name of the stop. In 1930, Walnut Hills’s census tract 21—the southwest quadrant near Florence Avenue—housed the highest density of Italians anywhere in the city. “When I grew up,” says Dillard, “we were always told Don’t cross Gilbert Avenue. Because they called that Little Italy. And we’d get beat up if we’d cross [into] Little Italy. It was an Italian slum, really—poor Italian families poured into that particular area as they immigrated into the U.S.” Meanwhile, tract 36—the northern part of the neighborhood—was nearly 90 percent black, matched at that point only by the West End, a fact Dillard attributes to Lane Seminary’s tolerant stance in welcoming former slaves to the area. Barbara Furr, longtime librarian of the Walnut Hills Branch, volunteer coordinator for the Stowe House, and a founder of the Walnut Hills Historical Society, says that from very early on “there was a small black community here because Kemper was one of the few people to rent or sell land to blacks—we’re talking from the early 1800s on.” When Furr moved to the neighborhood in the early ’60s, she remembers Graeter’s, Woolworth’s, a Chinese laundry, and pony kegs all nearby. “It’s always been a place you could walk,” she says. “We used to come to Walnut Hills on Saturdays to go shopping at Peebles Corner,” says Kathryne Gardette, former WHRF board chair and current Walnut Hills Area Council president, whose voice has a lyrical rhythm that immediately gives her away as a singer. She navigates a mental map of her visits: Ebony Records, Thatched Roof jeweler and seamstress. Later, when she moved to the neighborhood in the mid-’80s, “it had a lot more people. There were businesses all along here. The beauty salon, the pool hall, three meat markets, poultry places, fish markets, a fruit and vegetable market.” She remembers going to parties thrown by artists who lived in the old Trevarren building. Some places had started shuttering—which many attribute to the business district’s conversion to one-way streets, as well as a continued pattern of urban flight. But to those living there, the decline of Walnut Hills was gradual, not a jarring, singular event. The impact of Interstate 71 is one thing that most everyone agrees hurt Walnut Hills: The highway came in and there went the neighborhood. Although spared the wiped-off-the-map fate of swaths of the West End and Evanston, when I-71 came through in the ’70s East McMillan and Wm. Howard Taft were switched to one-way streets, forcing drivers to shoot through Walnut Hills as fast as possible. Which, it turned out, was not exactly great for business. So the neighborhood fought with the city for almost 20 years—paying for a study, then being told No, it’s not feasible, again and again—until finally their two main drags were switched back to two-way traffic in October 2012. According to Gardette and others, that simple traffic change seems to have turned the clock back for the business district. Neighborhood leaders and the WHRF spent years developing a form-based code to ensure future development along the new two-way streets fit their vision. Jeff Raser, a principal architect at Glaserworks and a key consultant for the code, describes its aim as preventing bad architecture (“Not aesthetically; I mean buildings like Kroger”—with large blank facades and off-street entrances—“that create an unsafe place and are bad for economic development,” he says) and allowing good architecture (“Mixed-use buildings that are up close to the sidewalks, just like the old buildings”). The new code also gives the community the authority to determine the size and type of buildings—which will soon be evident in new construction along East McMillan. Crime is not always as quick to change as plans for the landscape, however, and Walnut Hills still has its fair share. According to District Four Police Captain Maris Herold, it stems from a few specific street segments, addresses, and violent offenders. The statistics since 1997 show an overall peak in crime in 2006, with most categories (except theft) on the decline since. Poor-bordering-on-absent property management is the critical issue, Herold says; it allows crime to cluster, gives gangs a foothold, and drains police resources. Case in point: the Alms Hill Apartments. Opened in 1891 and expanded in 1925, the Hotel Alms was a regal place: the ballroom, the WKRC broadcast studios, the Tokyo Garden and Mermaid Lounge. But in the 1980s it was converted to 200 units of public housing under the Housing Assistance Payments program and has persisted on various Department of Housing and Urban Development subsidies since. For decades the building’s tenants have endured neglectful out-of-town owners and a laundry list of health and safety violations. The city has fought a long battle against its blend of blight and bad living conditions, ultimately leading to a search-warrant inspection last December (resulting in 29 pages of infractions) and a lawsuit set for trial next month. WHRF has been through its own ups and downs. Founded in 1977, its first 28 years are now recalled more for a lack of focus, dearth of resources, and occasional ineptitude. Positive things still happened—musician Ric Hordinski opened The Monastery, a recording studio and performance space, in 2005; Parkside Café filled the space vacated by Frisch’s in 2007—but generally without the group’s direction or assistance. Then in 2010, Greg Loomis stepped in to assume the role of WHRF’s executive director, and projects and partnerships were set in motion. But when Loomis passed away suddenly in August 2011, those in charge of WHRF’s future were left to wonder if it would even have one. There was a six-figure budget deficit from the recession, along with heartbreak and disillusionment. Wright came on that October, his first stop in a second career as an urban planner. He walked into WHRF’s office on May Street and found a three-ring binder with Loomis’s meticulous notes and little else. Over the past four years Wright has worked hard to find funding, added four full-time staffers, and shown that the group can do a lot with a little (their 2015 operating budget was $550,000). Wright doesn’t punt when it comes to the challenges and tensions that come with WHRF’s role, either. Over coffee in February, he laid it out: “We had these listening sessions last year, and there’s a trust issue.” Residents didn’t know what—or who—WHRF was, and were suspicious about what they were up to. So the organization moved its office to a first-floor space on Peebles Corner, and has continued its many-tentacled work of planning weekend music events and input sessions at the same time that it’s closing multi-million dollar development deals. From what Young sees, “there’s excitement because things are happening. There’s anxiety because neighbors are changing. There is fear, because, for me, the price of rent is going up. There are so many mixed emotions going on. And I think we need to be sensitive to those feelings. On both sides.” She praises Fireside Pizza for keeping things friendly, mentioning their intentional choice to keep a $2 beer among the craft selections and a $6 pizza on the menu—something Angst Coffeehouse has mirrored with its “beer it forward” neighbors-buying-drinks-for-neighbors idea. The neighborhood will not get back to 1940 or 1960 overnight—or ever. 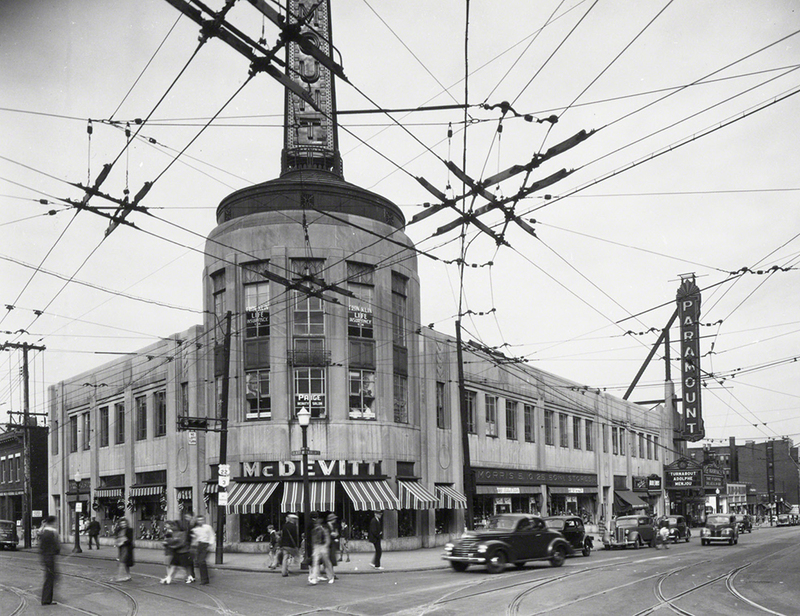 “In its heyday, the McMillan corridor was a mile long, and the vast majority of that was retail on the first floor,” says Jeff Raser of Glaserworks. That’s not likely in the new reality. But the I-71 MLK interchange, scheduled to be finished in 2017, will open up easier highway access to the neighborhood (though not without some trepidation about its effects). The Harriet Beecher Stowe House expects to receive some $2 million for renovations from the Ohio History Connection. At the end of September, WHRF purchased the old Paramount building, arguably Peebles Corner’s most prominent, which is currently in abject disrepair. They are working with (but at press time had not yet announced) a developer to construct new apartments and retail spaces on the vacant land next to Fireside Pizza and across from Green Man Park, as well as a future bar tenant for an historic (but long defunct) bath house nearby. The annual Cincinnati Street Food Festival, which gathered a large and diverse crowd in September, continues to grow. Five Points Biergarten and Music Off McMillan are preparing for a 2016 return. Even the Walnut Hills Historical Society is recording an oral history, hoping to document living memories before they’re lost. An historic aerial shot of Peebles Corner and Walnut Hills (photograph undated). Standing in line in late June at the weekly Findlay Market Farmstand on East McMillan, Gary Dangel, longtime resident and community volunteer, gets up from the Vitality Cincinnati table to introduce himself and offer a tour of the five gardens he helps run. The Concord Street Community Garden is brimming with beds (up to 60 this year) and a new retention pond and greenhouse. Seven people have gathered nearby in Green Man Park for a free yoga class, despite the 84-degree temperature. It’s seven days after the massacre in Charleston, yet things feel refreshingly…not impossible. Walnut Hills is far from carefree, but it’s not contrived stock-photo diversity, either; race, equity, change—what they mean and how they do or don’t work—is a conversation friends and neighbors are constantly having. For Orth, back at that sidewalk table at a once-abandoned firehouse that’s now putting out pizzas, looking over at a park-in-process, it’s all just measured strides. “We’re working real hard to continue being what we’ve always been,” he says.